Imagine a Carrot Loaf that’s not only delicious, but highly nourishing as well. Don’t just imagine it, you can eat it too with this Kefir and Carrot Loaf that’s stuffed full of all the goodness fruits, seeds and whole grains have to offer. Imagine a Carrot Loaf that’s not only delicious, but highly nourishing as well. Well, don’t just imagine it, you can eat it too with this Kefir and Carrot Loaf that’s stuffed full of all the goodness fruits, seeds and whole grains have to offer. Plus it’s lactose-free to boot thanks to Green Valley Organics and their delicious Lactose Free Kefir (which my kids are completely obsessed with btw). Thank you to Green Valley Organics for helping me to share this recipe with you. Oh my, how much better does it feel when the sun is shining on your face? This winter has been a harsh one, but the first glimpses of spring are starting to shine through, and I for one am SUPER excited!!! I whipped up a carrot loaf and we indulged in a little afternoon tea party in the yard, soaking up the first rays of sun this year had to offer. Positively glorious. For some reason the coming of spring always brings to mind visions of carrot cakes for me, but when it comes down to it you may as well be eating a candy bar with a lot of the recipes around! This Kefir and Carrot Loaf is still sweet and delicious and still tastes like spring, but is full of only good things. It is naturally sweetened and can totally be eaten for breakfast, or an afternoon snack! I used some lactose-free kefir in place of the traditional buttermilk called for in a loaf like this. It makes the carrot loaf experience one of wholesome indulgent richness, which I am all for. All of the products made by Green Valley Organics are gluten-free and lactose-free, so they are a great option for people with dietary restrictions. They are also free from artificial colors, sweeteners, flavors and preservatives. Not only that, but the cow dairies used for these products are Certified Humane, which means happy cows. Plus their products taste delicious, which my kids can attest to (seriously, they are going through this kefir like it’s going out of fashion). Tip: This bread freezes really well. I usually make two loaves at a time and cut one into slices. I pop the slices onto a baking sheet and pop them in the freezer. Once frozen, transfer from the baking sheet to a large ziplock bag and pop back in the freezer. Just remove as much as needed the night before you want to enjoy it and give it a bit of a toast in the morning. Slather with some butter or honey and you are good to go. I hope you love this lightened up spring family favorite as much as we do. I love hearing from you, so be sure to pop back and leave a comment if you give it a try. Imagine a Carrot Loaf that's not only delicious, but highly nourishing as well. Don't just imagine it, you can eat it too with this Kefir and Carrot Loaf that's stuffed full of all the goodness fruits, seeds and whole grains have to offer. In another bowl, combine the flour, flax seed, what germ, baking soda, cinnamon and nutmeg. Place the batter into a lightly oiled loaf tin and bake for about one hour, or until a skewer inserted into the centre of the load comes out dry. Remove from the oven and allow to cool before removing from the tin. Disclosure: This post is sponsored by Green Valley Organics. As usual, all opinions are my own, and I only share products I love with my readers. Please see our privacy disclosure for more information. This recipe looks so good! I’m a big fan of kefir, but have never baked with it before. I’ll have to try this! Perfect for spring entertaining. We are on the same page here! 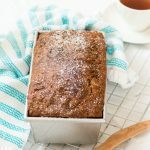 The moment the days become warmer, I start to think about carrot cakes hehe This carrot loaf looks absolutely delicious Donna. Love that is super nutritious and made with all healthy ingredients. Yup, it’s perfect for enjoying with afternoon tea. And for breakfast. Or as office snack 🙂 Pinning and sharing this! The cake looks so gorgeous Donna and such great flavor combination. I’m a sucker for herbs/spices fusion and this sounds delicious. I would definitely try it soon. Oh a hot carrot bread straight from the oven with a cup of tea sounds so yummy right now! I love that you used kefir! It’s so healthy and nutritious! I haven’t tried Kefir yet, your carrot loaf looks so perfect with some tangy cheese it is going to be great breakfast. Oh you should try it! If you like tangy cheese you will love kefir – its like a super creamy and tangy yogurt drink, so good! I’ve had kefir to drink before, but never thought of baking with it! Such a great idea. And love that this is a freezer friendly bread – I love baking on free weekends and stashing things away for weekends with company! Could coconut or almond flour be substituted for the whole wheat flour? Anything with kefir gets a thumbs up from me! Making a loaf like this that isn’t just yummy but has added nutritional benefits – sounds great! I love kefir and often buy it because my children enjoy it, too! I bet the kefir adds not just moisture but extra flavor to this gorgeous loaf. Perfect with a cup of tea! Wow, you have packed amazingly delicious flavor into this loaf. I love all the whole grains you packed into here too! Can’t wait to make this loaf and enjoy a slice with a cup of tea. I know right, the good weather shows up and suddenly everyone is all about brunch 🙂 Always nice to be prepared and have something easy and delicious to serve up! Oh my God, this sounds wonderful! I kept reading and scrolling and thinking, “Please cut the damn thing; I want to see what it looks like inside.” And, then, finally, the glory shot comes and there it is. Such a beautiful and tasty looking loaf. I cannot wait to try this! I’m always looking for new bread recipes since we love making different loaves and this recipe looks fantastic. Love the carrots and sunflower seeds! This sounds amazing! Love that it has carrot in it. Perfect for a wholesome brunch! Exactly 🙂 And it is definitely coming up to that time of the year when brunches seem to be the thing to do!! Spring is one of my favorite seasons. I just love to start seeing everything blooming again. This carrot loaf sounds so delicious and healthy too. I’ve never cooked with kefir. Think I need to give this a try. Mine too, it is definitely so uplifting to start seeing all the blooms come in. Our garden is starting to look so pretty already, and it just makes me so happy every time I look out the kitchen window 🙂 You should definitely try cooking with kefir, it is such a versatile ingredient, and so full of goodness! Kefir is such a healthy ingredient to cook/bake with. So much nutrition, and it makes things, especially in baking, so fluffy. I would eat this delicious loaf for breakfast!! It is isn’t it!! We have been loving it in our smoothies as well – so creamy!! What a wonderful idea to use all whole grains and natural sweeteners. I am a big fan of whole grain breads as I love the nuttiness and the earthiness of the loaf. This sure says spring to me and I am so ready for it. Oh I am so ready for it too 🙂 I am definitely a fan of the nuttiness and earthiness wholegrain bring to a baking – plus they keep your belly satisfied for much longer, which is always a plus, especially when there are little snack monsters around! !